Year to year, approximately 85 to 90 percent of conference attendees are HBA members, and most are women. The majority of registrants are mid to senior-level professionals, and approximately three-quarters of attendees have 10 or more years of experience in the healthcare industry. Registrants represent many sectors of the healthcare industry, with degrees ranging from the baccalaureate to doctoral level. Those with clinical degrees — MD, NP, RN, PharmD, RPh — typically work within industry (vs as practicing healthcare professionals). In 2016, the top three organization types reported by survey respondents were pharmaceuticals (48%), biotechnology (12%) and consulting (6%). 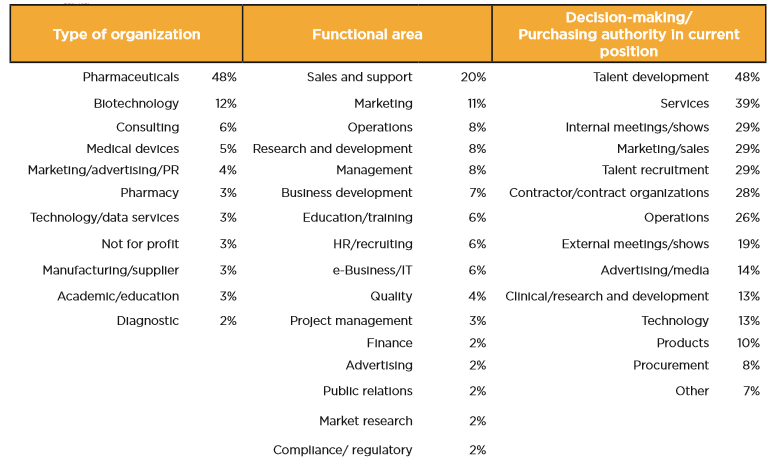 Top functional areas were sales and support (20%), marketing (12%) and operations, research and development, and management, each with 8%. 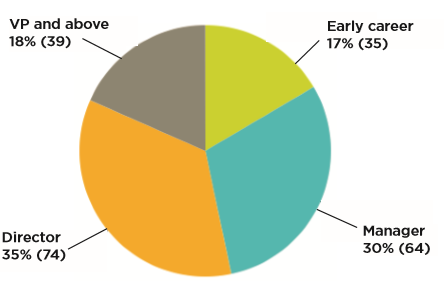 Respondents reported decision-making/ purchasing authority in many areas including talent development (48%), consulting services (39%) and meetings/events (36%).